At The Ganzhorn Suites dementia and Alzheimer's care center, residents dine when they want to. If a resident wakes up at 10 a.m., a member of our care team can make breakfast right in the household. If a resident wakes up at 2 a.m. and wants a snack, a member of our care team can prepare a nutritious snack that satisfies their craving. We work around our residents’ schedules, not what is convenient for us. Every day we prepare delicious meals served in each household’s family-style kitchen. Residents enjoy a wide variety of fresh foods at each meal. 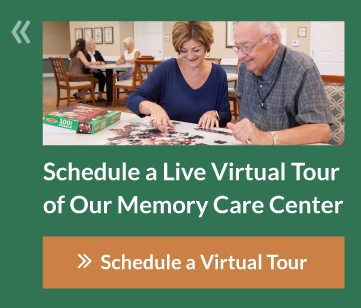 Our dining services team has created an experience specifically designed for the unique nutritional and dining needs of those with Alzheimer’s disease and other forms of memory loss. Small meals are served frequently throughout the day. We prepare uncomplicated foods that can be eaten easily to promote independence, and a dietitian oversees our menu selections to ensure all nutritional requirements are met.